Target Audience : Tourists and residents travelling to or within Ontario who are looking for something to do or somewhere to stay. Note: It has come to our attention that on some versions of Internet Explorer this form is distorted. To list, please either call us 1-866-385-1550 or complete it on Firefox or any other browser. Complete your company description based on your listing selection above. Duplicate your existing listing into multiple categories/regions for added exposure. Each additional listing is just $99. Please confirm your order below. If you have selected an upgraded listing, an SFG account representative will contact you shortly. 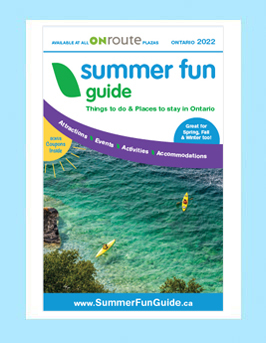 We look forward to including you in the Summer Fun Guide Print Edition. Thank you for your submission.